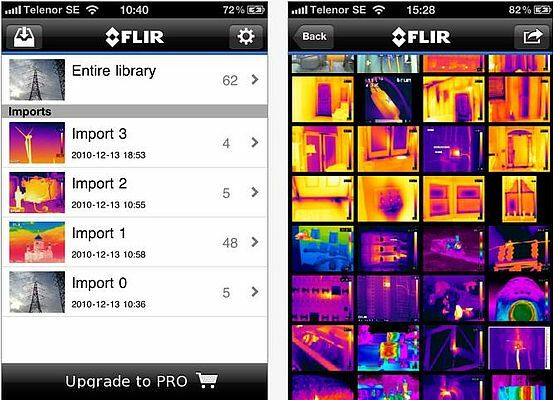 Using a thermal imaging camera’s built-in Wi-Fi, FLIR Viewer allows the camera to easily connect to an iPad, iPod Touch, or iPhone. Once connected, the company’s thermal imaging camera can send images and other data to an Apple mobile device wirelessly. The free version is now available to download from the Apple iTunes Store. The app lets users download images from their camera, change colour palettes, analyse the images, add data, create reports, upload to "the cloud" and e-mail thermal images to other colleagues instantly. There are a series of sample images that can be downloaded to the application so that any user can experience the functionality of the application for free, even without a camera.